"He completed the building of his Tiburtine villa in wonderful fashion, in such a way that he inscribed the most famous of names of provinces and places there." Pliny states that the setting of the Knidia was completely open so that the statue of Aphrodite could be viewed with equal admiration from every side (Natural History, XXXVI.21). It is a setting that is duplicated in the monopteros at Hadrian's villa (above), where a single ring of Doric columns once supported a domed roof, in the center of which a copy of the statue was found. In describing the fabulous barge of Ptolemy IV Philopator, Athenaeus mentions that it, too, had on board a rotunda-shaped shrine to Aphrodite, in which there was a marble statue of the goddess (V.205ff). 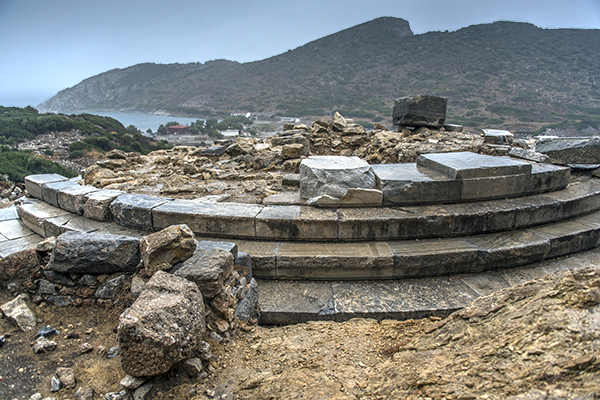 The ruins of Knidos (Latinized as Cnidus) are at the very tip of the Datça peninsula in southwest Turkey, which originally had been explored for the Society of Dilettanti by Sir William Gell in 1812 and later by Sir Charles Newton, who also discovered the Mausoleum at Halicarnassus. Among the artifacts brought back to England and acquired by the British Museum in 1859 was the battered head of a marble statue. In November 1970, Iris Cornelia Love, socialite and heiress to the Guggenheim fortune, created a sensation when she declared the head stored in the basement of the Museum to be that of Praxiteles' statue of Aphrodite. It was, in her words, "one of the most spectacular finds in the history of classical art." Piqued at the implication that Museum would not know what was in its own collection, it patiently explained that the head had been found at the Temple of Demeter more than a mile away and likely was that of Persephone, the daughter of Demeter. Earlier that year, Love had reported on her archaeological work at Knidos, where she identified a circular marble podium not remarked upon by either Gell or Newton, the dimension of which conformed to the rotunda constructed by Hadrian. The remains of a marble pedestal, on which the statue of Aphrodite could have been placed, also was found. The next season of excavation revealed an inscription that began with the letters "Prax..." and a broken Corinthian capital. A crack running through the podium, presumably damaged by an earthquake, had caused one section to subside and, on a terrace below the temple, there were fragments of a hand and drapery, as well as a finger, which Love suggested may have belonged to the Knidia. (A block with the inscription "Athena" also was found.) 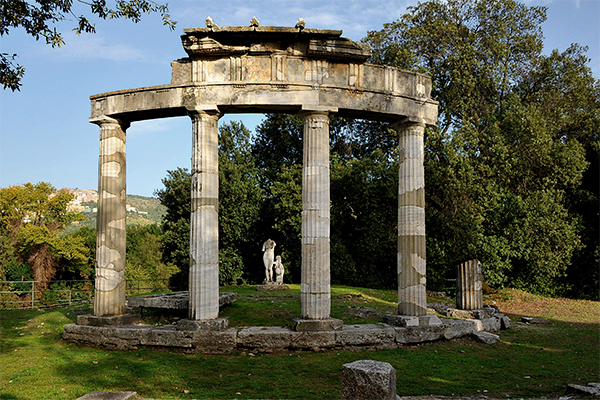 Given that the monopteros constructed at Hadrian's villa is Doric, it was conjectured that the Corinthian fragment belonged to an earlier temple that originally housed the statue, especially since the building, which she dated as later than the fourth century BC, is itself later than the Knidia. 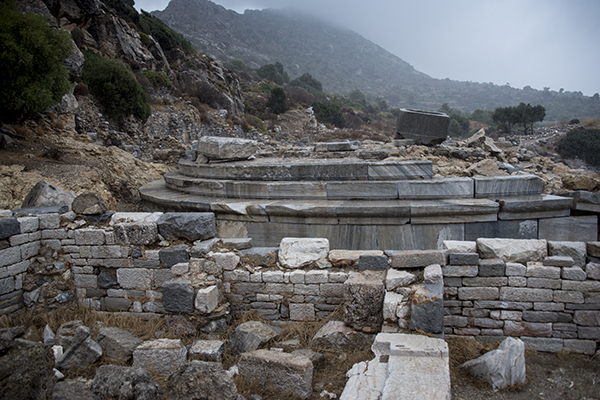 Continued work at the site by Ramazan Özgan has shown the round temple uncovered by Love to be a second-century BC tholos with an outer Corinthian colonnade and an walled inner room or cella. Moreover, it was dedicated, not to Aphrodite but to Athena. Nor is the fragmentary inscription that of the sculptor but a private dedication by a homonymous Praxiteles. 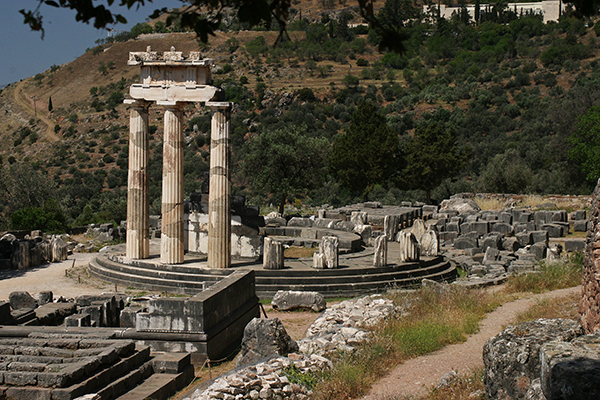 Lucian places the statue in a small rectangular shrine (naiskos) surrounded by trees and other vegetation (and not the paved area found at the tholos) to which there were two entrances, with a locked door in the back so that the goddess could viewed from behind. His account and that of Pliny, indicating that the statue could be seen from all sides, are not contemporary and it may be that, as the Knidia became more renown in the second century BC (possibly because of Roman expansion into the Mediterranean), the original setting was renovated to allow for more unobstructed viewing. Or the temple may have been reinstalled in a new location. 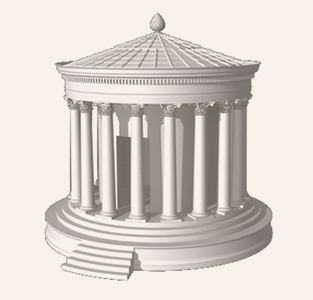 An architectural model of the tholos according to Bankel (Computergraphics for Archeology and History of Architecture). If the grey marble seems wet, it is because the pictures were taken in the midst of an early autumn storm, with gusting wind and drenching rain. Such weather, with torrents of muddy water rushing down the hillside, can only aggravate the subsidence of the ground supporting the temple, which is described at the site as the surviving foundation and podium of a tholos built in the second century AD. The stepped entrance, which still is visible, faced the altar. The second view shows the podium from above, with the harbor below. One can see that the southern portion already has weakened and begun to fall away, as very well may happen to more of the temple, if the cracks in the foundation and rutted, washed-out channels beneath the stone are any indications. A view from the west shows the fractured marble and weakening ground to better effect, and a final view from the east shows the steps. The more familiar view of the temple from the hill that raises above it simply was not a possibility, as the wind and rain made it impossible to clamber up to the top. The beautiful white marble statue of Aphrodite herself is in the small museum at Tivoli, watched over by an ever-present attendant who permits no pictures. References: "A Preliminary Report of the Excavations at Knidos, 1969" (1970) by Iris Cornelia Love, American Journal of Archaeology, 74(2), 149-155; this was one of several reports on campaigns that were published in AJA, including 72(2), 137-139; 73(2), 216-219; 76(1) 61-76, 393-405, and 77(4), 413-424; "Archaeology in Anatolia" (1992) by Machteld J. Mellink, American Journal of Archaeology, 96, 119-150; Second Chance: Greek Sculptural Studies Revisited ("Some Personal Thoughts on the Knidia") (2004) by Brunilde Sismondo Ridgway; Lives of the Later Caesars (1976) by Anthony Birley.